ENJOY THE VERY MERRIEST CHRISTMAS AND HOLIDAY SEASON EVER! 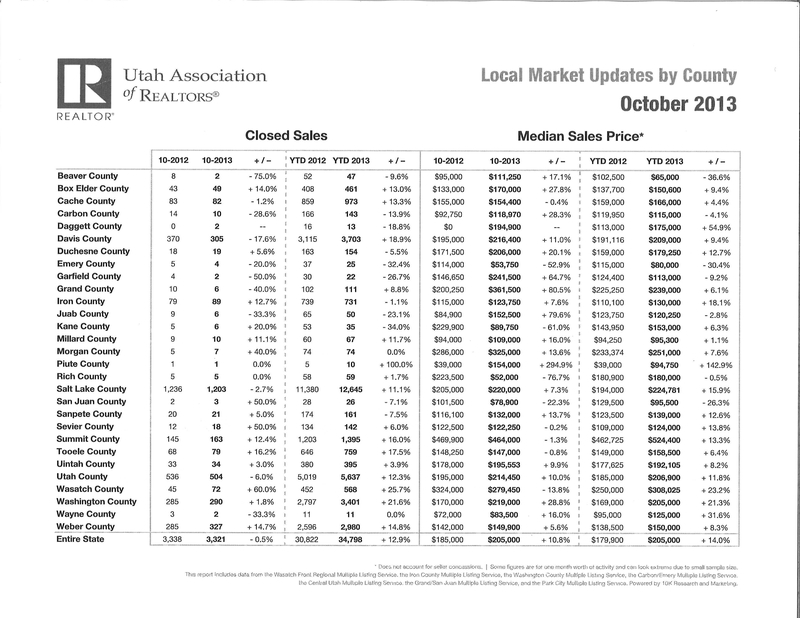 We have attached the 2 latest Utah Association of REALTORs (UAR) “Local Market Updates by County” for September and October 2013. It typically takes UAR 2 to 3 months to compile this data for all Utah counties. We are happy to include both reports in this Real Estate Update. You can review all counties. 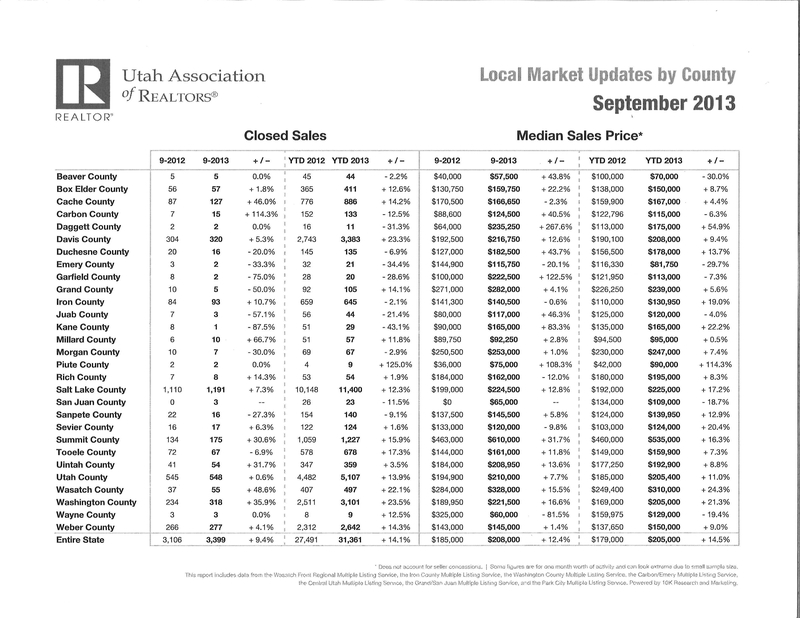 Iron County Year to date (YTD) closed sales are down 2.1% according to September’s report. Once again, I believe the reason is because there is not enough inventory in the lower price ranges for all of the buyers. We are still often getting multiple offers. This means if 3 people offer on the same house, only one can succeed in getting the home. If there were 2 more similar homes, there could be 2 more closed sales. The Median Sales price for September’s report is up 19% YTD in 2013 to $130,950 as compared to 2012 $110,000. Iron County closed sales are down 1.1% YTD according to October’s report. Median Sales Price is up 18.1% October YTD 2013 as compared to 2012. Single family homes are definitely the best sellers. Lack of inventory in some price ranges is obviously driving the prices up as buyers try to outbid each other to get their home. Homes do sell above listing price and above appraised value. It is the age-old story of supply and demand. Interest rates are still low enough that buyers are often surprised at how affordable their monthly payment can be—often lower than renting. Investors are in the market, but most buyers are purchasing homes as their primary residences. We are seeing 2nd home buyers. Buyers that lost their homes to foreclosures and short sales are now purchasing homes sometimes within a year of their loss. Renters are still looking for rentals but buyers who are used to owning their own homes are returning to buy again. Land, lots and commercial properties are slow movers. Very few buyers can afford to sit on land and wait for it to go up, and development costs discourage new subdivisions. Lots are selling at bargain lows, and we are seeing new construction and speculation homes for sale at competitive prices. Homes under $150,000 are attracting the large percentage of buyers, but homes are selling in other price ranges also when they are priced with the market. It is like buying a truck. Obviously, you wouldn’t pay $1,000 extra for a truck if you could get the same truck for a thousand less at a different car lot. Home buyers are no different. They spend hours on line researching the best deals. They have access to the multiple listing service (MLS) and often search the best price per square foot for their tour of homes. Then they buy the home that shows the best with the most upgrades in their favorite location. One of my sellers recently told me, “You can price a property to sell, or you can price a property to keep.” He wanted to make sure his property was priced to sell. That is actually the best way to get top dollar quickly. The Naisbitt-Bagley Team is happy to do a market evaluation to make sure your real estate is priced with the market. You don’t want your property to be the one that helps a buyer think someone else’s property is a good buy because it is so much lower than yours. Homes for sale as well as homes that have sold need to both be considered when pricing real estate. Someone asked if there are still short sales and foreclosures on the market. The answer to that is a resounding, “YES! and YES!” There are bargains available on those as well as on resale homes even though home prices are rising. Priced to sell—Call the Naisbitt-Bagley Team for a free market valuation. If it isn’t priced right, it may not even get shown. Showcasing—If the property isn’t dressed to sell, it most likely won’t get an offer unless the price is reduced drastically as a fixer-upper. Call the Naisbitt-Bagley Team to help you stage or showcase your home. Available to Show—Showing the home when the buyer wants to see it is a must. Most buyers are from out of area, and it is important to work around their schedule for showings if you want to make sure your property is shown, that it attracts offers, and that it gets marked sold. Agressive marketing–I don’t know of anyone marketing more aggressively than the Naisbitt-Bagley Team both on and off line.